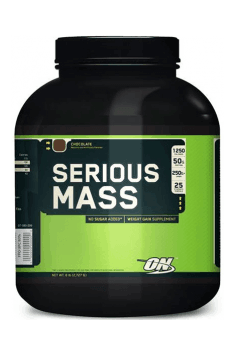 Serious Mass supplies you with the tools you need to pack on the pounds and develop the physique you've always wanted. Dissolve 170 g of the product in 200-300 ml of milk or still water. Take one portion (170g) immediately after training and the second portion (170g) during the longest break between meals. One portion (170g) in the morning or around midday, the second portion (170g) after a few hours. The ideal supplement to be used as a meal substitute or if you have no time to prepare a meal. It will also work great immediately after training. Each portion should be included into your calorie balance. Maltodextrin, Protein Blend (Whey Protein Concentrate, Calcium Caseinate, Egg Albumen, Sweet Dairy Whey), Cocoa (Processed with Alkali), Natural and Artificial Flavors, Vitamin and Mineral Blend (Dipotassium Phosphate, Magnesium Aspartate, Dicalcium Phosphate, Calcium Citrate, Ascorbic Acid, Niacinamide, Zinc Citrate, Beta Carotene, d-Calcium Pantothenate, d-alpha Tocopheryl Succinate, Selenomethionine, Copper Gluconate, Ferrous Fumarate, Manganese Amino Acid Chelate, Thiamin Mononitrate, Pyridoxine Hydrochloride, Riboflavin, Chromium Polynicotinate, Folic Acid, Biotin, Molybdenum Amino Acid Chelate, Cholecarciferol, Potassium Iodine, Cyanocobalamin), Acesulfame Potassium, Lecithin, Medium Chain Triglycerides. Contains milk, egg, wheat (glutamine peptides) and soy (lecithin) ingredients.